Wimberley High School’s Lone Star Theatre students in another great production! Wimberley High School’s Lone Star Theatre students, who entertained audiences last December with their interpretation of the life of Helen Keller, traveled back to the post-World War II era in “The Teahouse of the August Moon” in nightly performances in early December. Familiar to many as a movie starring Marlon Brando and Glenn Ford, the Tony-winning script of “The Teahouse of the August Moon” was written by John Patrick in 1953. The play gently spoofs the efforts by the American military to bring democracy and American ideals to post-WWII Okinawa. Captain Fisby (played by Jake Patoski) is sent to the village of Tobiki to build a schoolhouse, although they would prefer to have a teahouse. 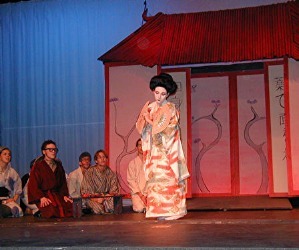 Fisby’s initial resistance to the native customs, including the gift of a geisha (Lotus Blossom, played by Julia Trinidad) quickly wanes, thanks to both the geisha’s charms and the often-hilarious efforts of his translator, Sakini (Duncan Coe). Fisby’s blustering supervisor, Col. Wainwright Purdy III (Ben Bond) sends Army psychologist Capt. McLean (Alan Colwell) to straighten things out in Tobiki, but it doesn’t take long for McLean to also fall under the natives’ spell. The village’s flourishing moonshine operation and a newly constructed teahouse face the ax when the furious Colonel finally comes to call. The state champion cast of “The Teahouse of the August Moon” was led by the husband/wife directing team of J. Gary Wyatt and Lydia Miller-Wyatt, who were honored as Educators of the Year in January by the Texas Educational Theatre Association. Known for their competence in all areas of theatre production, the students constructed the gracefully artistic set, made costumes and props, and ran lights and sound for the production. Cast: Duncan Coe (Sakini); Russ Hull (Sgt. Gregovich); Ben Bond (Col. Wainwright Purdy III); Jake Patoski (Capt. Fisby); Taraka Larson (Old Woman); Kellee Watson (Old Woman’s Daughter); Andrew Patoski, George Matthews, Ty Reeves (Old Woman’s Children); Ashley Byers (Lady Astor); Will Campbell (Ancient Man); Bobby Byers (Mr. Hokaida); Cole Sutera (Mr. Omura); Kyle Studer (Mr. Sumatra); Peyton Harrison (Mr. Seiko); Alequah Price (Miss Higa Jiga); Will Harrison (Mr. Keora); Jon Matthew Chonko (Mr. Oshira); Patrick Byers, Zane Gordon-Bouzard, John Rogers, Jesse Sutera, Matt Whittlesey, Paul Redkevitch, Ashley Ogletree, Bonnye Cope, Krystal Erekson, Kathryn Wade, Meghan Speakerman, Emily Baker, Holly Landaker, Heather Murphy, Elizabeth Willis, Jessica Brumfield, Emilie Woodard (Villagers); Jagar Ridenour, Amelia Harrison, Emily Stengel, Taylor Harrison, Annie Bond, Trilby Fortenberry, Sarah Bond, Elena DiTraglia, Kirstin Yingling, Emily Madden, Tracey White, Amanda Ogletree (Ladies League for Democratic Action); Julia Trinidad (Lotus Blossom); Alan Colwell (Capt. McLean).